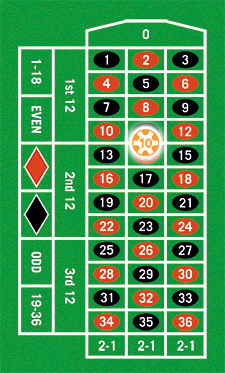 Inside bets are bets placed on the inside part of the roulette table. These bets usually have minimum wager requirements. 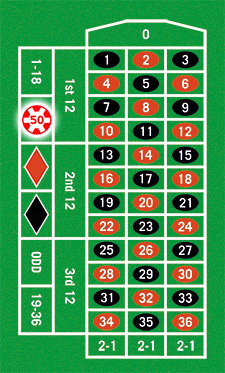 For instance, if the minimum wager requirement is €5, you can choose between placing five 1 chip bets on five different numbers or you can only place a €5 bet on a single number. A straight bet, also known as classic bet, is when you place a wager on the next number you think the roulette ball will land. The payoff of this type of bet is 35-1, which means that if you, for example, bet €10 on number 20 and this number comes up, you will get €350 euros. On the other hand through, this is the worst odd of any bet placed on the roulette table. 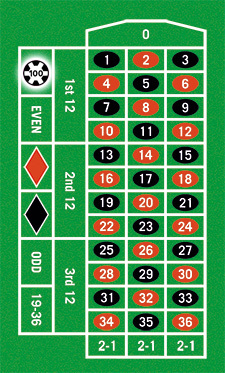 If you place a chip on the line that separates two different numbers, then you are making a Split Bet, also referred as Two Number bet. The payout of this type of bet is set at 17 to 1. Let’s imagine that you have placed a €10 chip between 27 and 30. If either number comes up, then you will win €170. The Three Number bet is also known as street bet or stream bet. 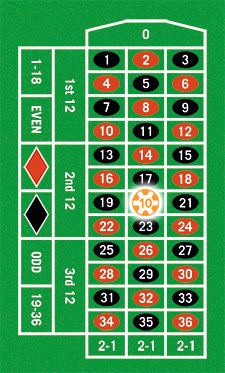 This means that you are placing a bet on three numbers. This bet has 11 to 1 payoff. 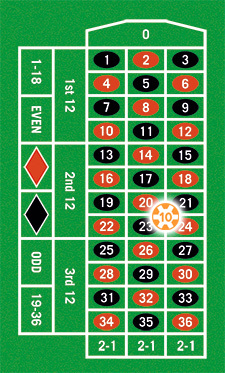 For example, if you place a €10 wager on 16, 17 or 18, you will get €110 if the ball lands on any of three numbers. 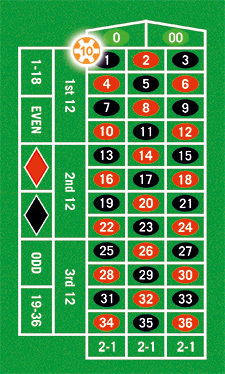 Square Bet or Four Number bet is when you place a bet on four numbers. The payout of this bet is set at 8 to 1. 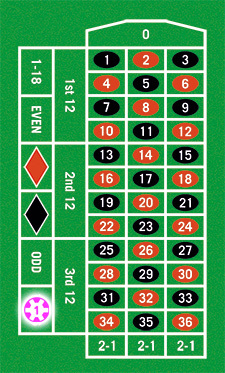 For instance, if you bet €4 on numbers 25, 26, 28 and 29, you will win €32, but only if the ball lands on any of these numbers. 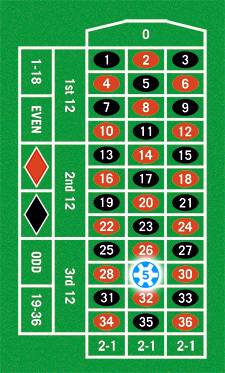 The fans of American roulette can place a bet called Five Number. 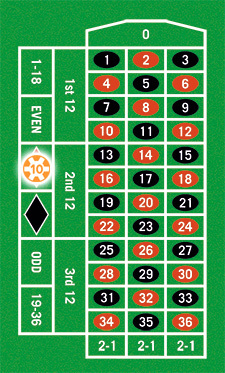 This is when a player places a wager on the following five numbers: 0, 00, 1, 2 or 3. This bet has 6 to 1 payoff. For example, if you place a €6 wager that one of these five number will hit, you will get €36. Worth to mention is that this is a very poor bet and should be avoided. Outside of the number grid are the outside bets and these are even/odd, red/black, 1-18/19-36, 1st 12, 2nd 12, 3rd 12 and the three 2-1s. 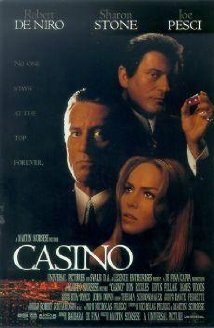 On the roulette table, they are the closest to the player. If you are betting on red, it means that you are betting that in the next spin the ball will land on a red-colored number. The payoff is 1-1, so if you bet €10 and the ball indeed lands on red, then you will get your original €10 back as well as an additional €10 for the win. Betting that the ball will land on black is the same as betting on red. The payoff is also 1 to 1. 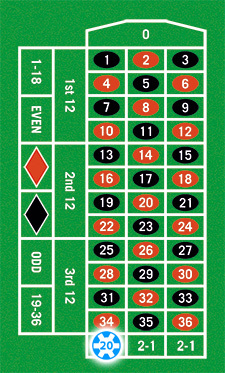 Therefore, if you bet €20 on black-colored numbers and the ball lands on black, you will win €40. 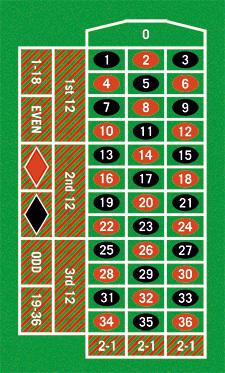 An odd number bet is when you bet that the ball will land on an odd number. This bet has a 1 to 1 payoff. 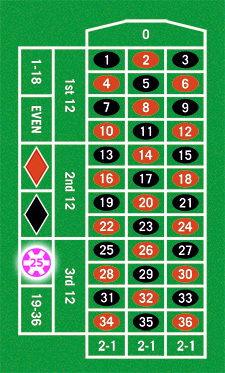 For instance, if you place a €25 chip on the “odd” square, you will bet your original €25, plus an additional €25. 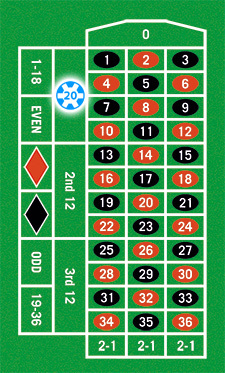 An even number bet is the opposite of an odd number bet. This is when you think that the spinning ball will land on an even number. The payout of this type of bet is set at 1 to 1 or even money. Therefore, if you bet €50 and you win, you will get €100. Another type of bet that has a 1 to 1 payoff is the High Bet. This is when you bet that the ball will land on the high numbers or any number between 19 and 36. A Low Bet is the opposite of a High Bet. This is when you bet that the ball will land on one of the numbers 1-18 on the next spin. The payoff is even money; therefore, if you bet €100 on 1/18, you will win €200. 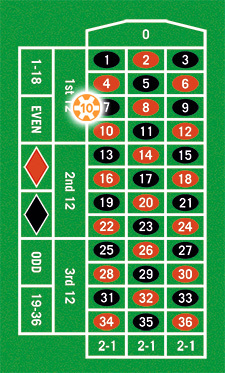 The roulette table is divided into 3 different “dozen” groups: 1-12 (or 1st 12), 3-24 (or 2nd 12) and 25-36 (or 3rd 12). This type of bet has a 2 to 1 payoff. 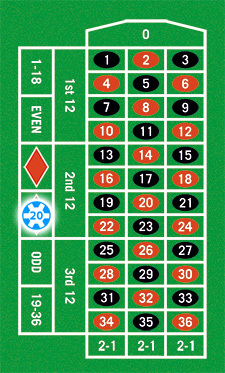 For example, if you place a €20 bet on the 1st dozen and the spinning ball lands on 6, you will get your original €20 as well as an additional €40 for the win. 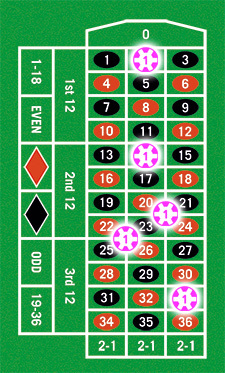 At the end of the roulette table, there is space reserved for the column bet marked as three 2-1s. They refer to the three columns of numbers: the top, the middle and the bottom column. This bet has the same payoff as the dozen bet.